"I wish I could go back to second grade, so Mr. Bonner could be my teacher," were the words Ellen Degeneres released on her social media accounts to 50+ million followers. This is when she learned of how Mr. Bonner's mind capturing teaching methods encouraged students to go above and beyond on a reading test. He was nothing short of AMAZING. His message was spot on, everyone enjoyed his energy and the fact that he could speak specifically from the teacher perspective!!! Everyone left with such excitement! In fact, everyone stated it was the best convocation ever. Michael totally rocked! We are so grateful!!! We absolutely LOVED Michael Bonner! His message was EXACTLY what our teachers needed to hear! He was gracious, generous, and simply downright wonderful! Michael was fantastic! I've had more positive comments about him than any other speaker I have contracted with for Institute Day. The fact that he is still in the classroom, he was able to resonate so well with our teachers. He adapted his presentation with our theme seamlessly. He is a very genuine person. I would highly recommend him for other districts. It was such an AWESOME day!! Michael did an AMAZING job!!! Teachers and administrators left inspired and ready to conquer the new year. Thank you so much for representing Michael and making it possible for us to book him for our EPIC day! Mr. Michael Bonner did a terrific job speaking to members and guests at the Greenville-Pitt County Chamber of Commerce's March 21 Power Luncheon. It was clear from the start that Mr. Bonner had the unique ability to capture an audience with a moving message and he had the packed Hilton ballroom fully engaged. Mr. Bonner spoke with such enthusiasm and purpose and he cleverly sprinkled in some humor along the way. He used an expressive voice and an effective cadence to make a connection with the audience. Mr. Bonner exuded such passion for his students and profession, which set the stage for such a refreshing message. After my visit to Mr. Bonner's classroom I honestly wanted to go right back to my students I used to teach in Durham and roll up my sleeves and go teach again. I thought about how really Mr. Bonner's classroom is primarily a MINDSET shift to POSITIVE thinking and law of attraction! Mr. Bonner is a visionary leader and creates that positive mindset within ALL students. Mr. Bonner also doesn't just expect excellence in academic performance, but maintains this level of excellence in student's social behaviors, in leadership and service skills, and building empathy and civic dispositions. Mr. Bonner is not just empowering his students to become proficient on a test, but empowering civic mindedness, caring citizens, and future leaders of our society? 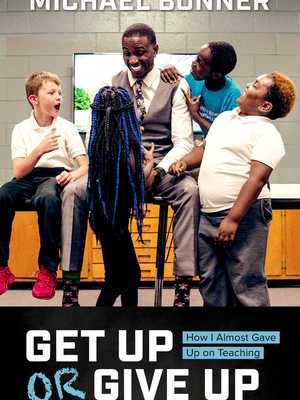 Michael Bonner New Book Release Get Up or Give Up!